Runner-up was Brad Bordson (also runner-up in 2010) of Marysville, CA. His stunning 1,693-pound Giant Pumpkin (pictured below) also set a new California State record. Third place went to Tim Mathison (he placed 12th in 2010) of Napa, CA with his winning 1,554-pounder (pictured below). Tim has been growing pumpkins for only five years, so that’s quite an accomplishment. Guess wine isn’t the only thing Napa is famous for these days! Coastside Pumpkin Winner (for the second year in a row) went to Farmer John of Half Moon Bay. His winning pumpkin weighed in at an impressive 755 pounds (almost double the weight of his 2010 winning pumpkin). 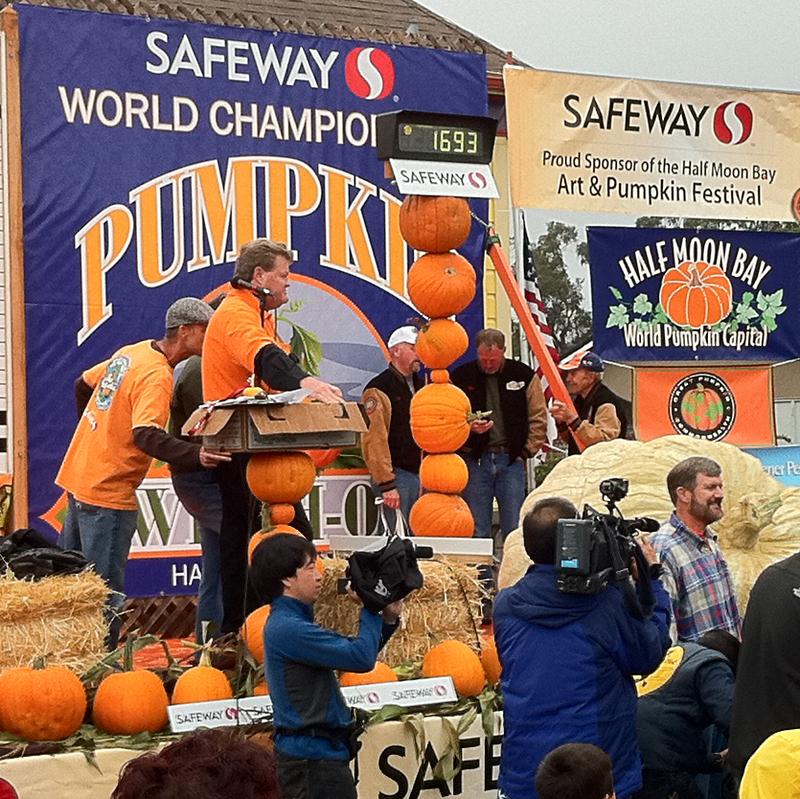 The Most Beautiful Pumpkin went to Eric Carlson of Portola Valley, CA. The 286-pound beauty (pictured below) won based on color, shape and size. Disqualified Pumpkin went to Russ Pugh of Santa Rosa, CA. His massive 1,794-pound pumpkin (pictured below; that’s me keeping warm with my morning cup of coffee) was disqualified because of a hole at the bottom that extended all the way up to the pumpkin’s core. If not for that hole, his pumpkin (weighing 90 lbs more than the winning pumpkin) would have taken first place! As the Pumpkin Weigh-Off was winding down, the heavy mist turned to rain. Didn’t seem to bother the crowds who stayed after the competition to watch the Sardine Family Circus perform (they’re on tour from London, England and will also be performing at next weekend’s Half Moon Bay Art & Pumpkin Festival). They’re VERY entertaining!